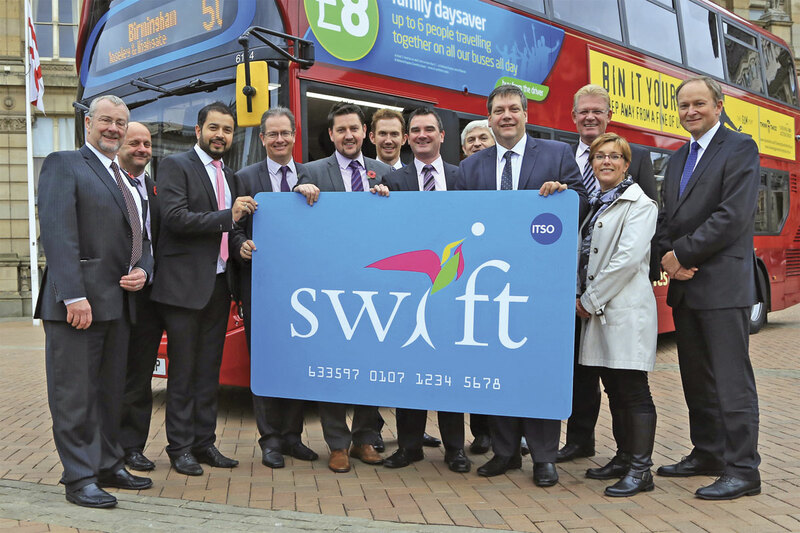 Centro have extended ‘pay as you go’ on their Swift smartcard to the whole of the West Midlands with a formal launch in Birmingham’s Victoria Square. National Express West Midlands provided one of their recently delivered ADL Enviro400MMCs as a backdrop to the event supported by stakeholders including West Midlands Integrated Transport Authority (WMITA), Centro, operators and suppliers. The Swift smartcard was first introduced by Centro in 2012 with experience gained in a trial area using both pay as you go and a range of season ticket products. The current launch extends ‘pay as you go’ across the West Midlands area with 26 out of 30 operators running services within the area participating. In support of the wider roll out, Centro has supported 22 smaller operators in acquiring the appropriate card reader technology and in the provision of back office services to process data and payments from the cards. For Peter Coates, MD of the largest operator involved, National Express West Midlands, the card addresses the need for better and easier ways to pay expressed to him by customers on a daily basis. The company has risen to the challenge of implementing Swift with a training programme encompassing over 4,000 staff. The ITSO standard Swift ‘pay as you go’ card is currently available free of charge (when a minimum £10 top up is purchased) from Centro Travel Centres and 250 Payzone outlets or by post when credit is purchased on line. Cards may be topped up to a maximum of £50 at the same locations and online, transferring credit using either the Swift card android app or one of around 100 Swift card collector machines being installed at bus stops throughout the West Midlands. Automatic top up by direct debit is a further option. Cards are not personalised but can be registered to safeguard the credit thereon in case of loss or theft. Using Swift in ‘pay as you go’ mode requires it to be placed on the reader whilst a ticket is printed, either a single or any version of the Network West Midlands day pass. 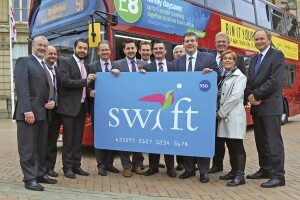 In addition to ‘pay as you go’, weekly and monthly travel passes can be stored on Swift cards. Swift is currently available on the buses of participating operators, many of whom offer discounts on single fares using ‘pay as you go’ and will be extended to Midland Metro in January when work to connect the city centre extension is completed. Where services cross the current West Midlands boundary, acceptance of Swift on cross boundary services is an operator led decision although two significant providers of cross boundary services are not yet participants in Swift. Swift stakeholders gather around an oversized card. West Midlands ITA considers Swift to be ahead of the game in smart ticketing having tackled first what is seen by other ITAs as the most difficult area, buses run by multiple operators. This multi operator commitment to Swift is a sign of the partnership working which has been promoted by Centro and operators through the Network West Midlands scheme. In addition to bus operators, Centro has worked with RSL (now part of 21st Century Technology), Unicard, Systra and Payzone to deliver the Swift project. Development of Swift will continue with the next objectives being the extension to rail services and the introduction of contactless cards. Work is also in progress sharing the experience of Swift development and implementation with other ITA areas to enable them to achieve similar benefits in a shorter timescale. Further opportunity for the smartcard system is likely to result from the potential devolution of transport powers to a geographically larger Midlands powerhouse organisation.